Background: Pemetrexed is a folate antimetabolite chemotherapy agent used for locally advanced or metastatic nonsquamous non–small-cell lung cancer (NSCLC) and mesothelioma. According to the product labeling, pemetrexed should not be used in patients with a creatinine clearance (CrCl) level <45 mL/min. Data are limited on the efficacy and safety of pemetrexed in patients whose renal function is below the recommended level. Objective: To describe the use of pemetrexed in an elderly woman with stage IVa NSCLC whose CrCl level was <45 mL/min, with modified dosing and scheduling. Case: Our patient, a 70-year-old woman, underwent 4 cycles of carboplatin and pemetrexed, then continued on maintenance pemetrexed for 51 doses. Initially, she received full doses (500 mg/m2) of pemetrexed every 3 weeks. At dose 14, a reduction to 400 mg/m2 occurred. At dose 16, the treatment interval was extended to every 4 weeks because edema developed in her right lower extremity, accompanied by reduced renal function. Throughout 4 years of treatment, the patient reported minimal toxicities and her disease remained stable. During treatments, her CrCl level ranged from 25 mL/min to 55 mL/min. Conclusion: To our knowledge, this is the first published report of pemetrexed use at a reduced dose and extended frequency interval for maintenance therapy in a patient with a CrCl level <45 mL/min. The patient experienced minimal adverse effects and tolerated the treatment for more than 4 years despite impaired renal function. Larger long-term studies are warranted to fully evaluate the efficacy and safety of using alternative doses and scheduling intervals in such patients. Mita and colleagues conducted a phase 1 clinical study to determine the toxicities, pharmacokinetics, and recommended doses of pemetrexed in patients with cancer who had normal or impaired renal function.7 Patients received ≥500 mg/m2 of pemetrexed as a 10-minute infusion every 3 weeks. Hematologic toxicities were common, occurred in all treatment groups, and did not correlate with renal function. Neutropenia tended to decrease with vitamin B12 and folic acid supplementation regardless of pemetrexed dose, but the study groups were too small to perform a meaningful statistical analysis of this effect. Nonhematologic toxicities such as fatigue, diarrhea, and nausea occurred infrequently in the study and did not appear to be related to renal function. Pemetrexed plasma clearance correlated positively with the patients’ glomerular filtration rate (GFR), whereas systemic exposure to the drug correlated inversely with GFR. Accrual of patients with a GFR <30 mL/min was discontinued after a patient with a GFR of 19 mL/min died as a result of treatment-related toxicities. We report on a patient with adenocarcinoma of the lung and impaired renal function for whom adjustments were made to the maintenance doses and frequency of pemetrexed administration. A 70-year-old woman presented in April 2011 with complaints of dyspnea during exertion. 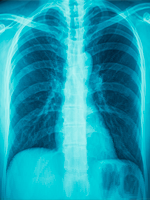 A chest x-ray was obtained and showed right-sided pleural effusion. After her initial thoracentesis, which was performed in March 2011 at a different facility, the cytology was positive for malignant cells consistent with primary adenocarcinoma of the lung. A computed tomography (CT) scan showed multiple nodular densities in the right lung along with a small residual effusion. The patient was diagnosed as having stage IVa adenocarcinoma of the lung secondary to malignant pleural effusion. However, there was no evidence of extrathoracic disease or involvement of the central nervous system. The patient’s medical history included chronic obstructive pulmonary disease, osteoporosis, anxiety/depression, anemia, and vasculitis. Her surgical history was significant for left breast lumpectomy (30 years earlier) and tonsillectomy. The patient admitted to a 25 pack-year smoking history and daily consumption of 1 to 2 glasses of wine. At the time of presentation, her home medications and supplements included aspirin (81 mg daily), fluticasone/salmeterol (500/50 µg, 1 puff twice daily), albuterol (2 puffs every 4 hours, as needed), alendronate (70 mg weekly), tiotropium (1 puff daily), multivitamin (1 tablet daily), calcium (500 mg twice daily), megestrol (400 mg twice daily), and bupropion sustained release (150 mg daily). Chemotherapy-related supplements and medications included pemetrexed, carboplatin, folic acid (1 mg daily), vitamin B12 (1000 µg intramuscularly every 3 cycles of chemotherapy), and granisetron (3.1 mg/24-hour patch every week). Her premedication steroid regimen consisted of dexamethasone 4 mg orally, every 12 hours, starting the day of chemotherapy and extending for 3 days, and dexamethasone 8 to 10 mg IV immediately before treatment. She also received antinausea medication prior to chemotherapy (either granisetron [1 mg IV], palonosetron [0.25 mg IV], or ondansetron [16 mg IV]). Her CrCl level at presentation was 48 mL/min according to the Cockcroft-Gault equation. Other laboratory values are listed in Table 1. In March 2011 the decision was made by the oncologist to initiate first-line treatment of carboplatin plus pemetrexed for advanced NSCLC. The tumor was anaplastic lymphoma kinase negative, with wild-type epidermal growth factor receptor. During a physical examination prior to the first treatment with pemetrexed plus carboplatin, the patient reported worsening of the dyspnea and complained of anorexia and fatigue. Her performance status was not documented before treatment initiation, but her status at dose 2 was 1 on the Eastern Cooperative Oncology Group (ECOG) scale. Initial physical examination revealed extremities that were free of edema. Table 2 provides a brief summary of the treatment cycles, doses, CrCl ranges, and comments noted in the patient’s medical record. Two weeks after dose 13 of maintenance therapy, edema developed in the patient’s right lower extremity. She was examined by her primary care physician, and ultrasound findings were negative for deep venous thrombosis (DVT). Physical examination showed extremities with edema (grade 1+) and discoloration of the right leg. It was decided to lower her dose of pemetrexed to 400 mg/m2 starting at maintenance dose 14 and to continue the dosing schedule of every 3 weeks. Dose 15 was held due to worsening edema in the patient’s right lower extremity. Physical examination showed discolored extremities with grade 2+ right pedal edema, which were tender on palpation. Ultrasound findings were negative for DVT. After a 6-week hiatus from chemotherapy and significant improvement in the edema, it was decided that chemotherapy at 400 mg/m2 would be resumed on a 4-week-interval dosing schedule. The oncologist had a thorough discussion with the patient and her husband about the risks and benefits of proceeding with maintenance chemotherapy (prior to dose 20), with a CrCl level of 35 mL/min and persistent right lower extremity edema. With a reduced dose and extended frequency, the patient continued the modified regimen, with limited adverse effects and toxicities. Other than the edema, the patient has not experienced any significant toxicities throughout maintenance chemotherapy. The oncologist believed that she had a vascular component superimposed on drug toxicity. The discomfort in her right lower extremity improved considerably and flared only for 1 or 2 days following each treatment. A Doppler study performed April 2012 showed no significant peripheral artery disease. Her disease has remained stable. Maintenance dose 27 was held because of mild dehydration (blood urea nitrogen level of 24 mg/dL), elevated serum creatinine (1.1 mg/dL), and upper respiratory infection. Mometasone/formoterol (100/5 µg) was added to the patient’s treatment. Her performance status after treatment initiation was 1 or 2 on the ECOG scale after the initiation of mometasone/formoterol. Since maintenance dose 27, she remained at performance status 1 or 2 until her last visit at our facility. Occasional wheezing was heard in both lungs. In January 2014, after dose 42, the patient reported slight swelling of her left leg. Her primary care physician (PCP) ordered ultrasonography of both legs, and findings were negative for blood clots. The patient stated that she was prescribed furosemide 10 mg by mouth, as needed by her PCP. One month later, she was receiving furosemide 10 mg by mouth daily from her PCP. At maintenance dose 49, the patient’s dose of pemetrexed was reduced to 350 mg/m2 because of decreasing renal function, evident by a CrCl level of 25 mL/min. Until October 2014, her CT scans obtained throughout treatment (since 2011) showed no evidence of active disease or progression of disease. Her baseline serum creatinine level had remained relatively stable, at approximately 0.8 mg/dL (CrCl, 48 mL/min), with a peak level of 1.5 mg/dL (CrCl, 25 mL/min) on dose 51 visit lab tests. In October 2014, a routine CT scan demonstrated a new pulmonary nodule as well as a new thymus nodule, both of which were scheduled to be re-evaluated by CT scan 3 months later. However, the patient transferred to another facility for continuation of care. We conducted a PubMed search, limited to the past 10 years, using the term pemetrexed with the following key terms: every 4 weeks, every 28 days, extended dosing interval, renal insufficiency, renal impairment, reduced dosing, elderly, and geriatrics. Relevant articles are summarized below, particularly as they relate to our case report. Gridelli and colleagues retrospectively analyzed 2 large randomized studies to evaluate the survival rates and safety of treatment with pemetrexed in elderly patients relative to younger patients.13 The first study by Scagliotti and colleagues enrolled 1725 patients. In this first-line treatment study of pemetrexed with cisplatin versus cisplatin and gemcitabine, 1252 patients with nonsquamous NSCLC were included; 32.7% of the patients were aged ≥65 years and 12.8% ≥70 years.13,14 In the second study, Ciuleanu and colleagues assessed single-agent pemetrexed with placebo in the maintenance setting (N = 663); 481 patients with nonsquamous NSCLC were included, of which 33.1% were aged ≥65 years and 16% were aged ≥70 years.9,13 All patients had performance status of 0 or 1 before treatment. It appears that edema is a rare complication of pemetrexed. In our patient, this side effect led to a dose reduction and an extension of the dosing interval (to every 4 weeks). The team determined that this was a vascular component superimposed on drug toxicity. D’Angelo and colleagues identified 14 patients with stage IV adenocarcinoma of the lung who received pemetrexed therapy (300-500 mg/m2) and experienced peripheral edema and erythema of the lower extremities.15 The median time of edema occurrence was dose 8 (range, doses 3-23). The edema was resolved by dose reduction (5 patients) or by discontinuation of treatment (8 patients). DVT was ruled out in 13 of the 14 patients. Treatment included antibiotics, diuretics, or prednisone. For some patients with renal dysfunction, drugs that are eliminated renally, such as nonsteroidal anti-inflammatory drugs (NSAIDs), may reduce renal excretion of pemetrexed and result in toxicity.1 NSAIDs with longer half-lives should be discontinued at least 5 days before pemetrexed treatment in patients with mild or moderate renal insufficiency, and NSAIDs with shorter half-lives should be discontinued 2 days before pemetrexed treatment.1 After completion of pemetrexed therapy, NSAIDs should be avoided for at least 2 days.1 Ibuprofen (400 mg 4 times daily) reduces pemetrexed clearance by approximately 20% (and increases AUC by 20%); however, patients with normal renal function (CrCl level, ≥80 mL/min) may receive ibuprofen concurrently with pemetrexed.1 For patients with mild or moderate renal insufficiency (CrCl level, 45-79 mL/min), concomitant administration of ibuprofen and pemetrexed should be carefully monitored.1 Aspirin at low to moderate doses (eg, 325 mg every 6 hours) does not influence the pharmacokinetics of pemetrexed.1 Our patient was taking aspirin 81 mg daily during pemetrexed treatment. The higher incidence of adverse effects associated with pemetrexed use in patients with reduced renal function has been well documented. Results of a Japanese retrospective analysis by Kono and colleagues, published in 2014, elucidated the risk factors for pemetrexed-related toxicities in the presence of reduced renal function.16 Thirty-eight patients with CrCl <45 mL/min who received pemetrexed were evaluated for neutropenia, thrombocytopenia, and nausea of grade 3 or higher. These severe side effects developed in 13 (34%) patients. Multiple logistic regression analysis demonstrated that a CrCl level below 30 mL/min (P = .033) and concomitant use of NSAIDs (P = .012) were significant risk factors for adverse events. Currently, only the abstract of their article is available in English. The frequency of administration is not stated in the abstract. Our patient had a relatively high risk for renal dysfunction because of her age (>65 years) and smoking history. Although she was taking aspirin 81 mg daily, the pharmacokinetics of pemetrexed should not be affected by such a low dose. To our knowledge, this is the first report of pemetrexed being used successfully as long-term maintenance treatment for nonsquamous NSCLC, with a reduced dose and extended interval between cycles. Pemetrexed is generally well tolerated with appropriate supportive care, but the lack of data for patients with renal impairment limits its use in this population. An extensive individual risk-versus-benefit analysis must be conducted before deciding to use pemetrexed in any patient with renal impairment. 1. Alimta (Pemetrexed) [package insert]. Indianapolis, IN; Eli Lilly and Company; 2013. www.accessdata.fda.gov/drugsatfda_docs/label/2009/021462s021lbl.pdf. Accessed August 1, 2014. 2. Hanauske AR, Chen V, Paoletti P, Niyikiza C. Pemetrexed disodium: a novel antifolate clinically active against multiple solid tumors. Oncologist. 2001;6:363-373. 3. Molina JR, Adjei AA. The role of pemetrexed (Alimta LY231514) in lung cancer therapy. Clin Lung Cancer. 2003;5:21-27. 4. Zukin M, Barrios CH, Pereira JR, et al. Randomized phase III trial of single agent pemetrexed versus carboplatin and pemetrexed in patients with advanced non-small cell lung cancer and Eastern Cooperative Oncology Group performance status of 2. J Clin Oncol. 2013;31:2849-2853. 5. Shih C, Chen VJ, Gossett LS, et al. LY231514, a pyrrolo[2,3-d]pyrimidine-based antifolate that inhibits multiple folate-requiring enzymes. Cancer Res. 1997;57:1116-1123. 6. Latz JE, Chaudhary A, Ghosh A, Johnson RD. Population pharmacokinetic analysis of ten phase II clinical trials of pemetrexed in cancer patients. Cancer Chemother Pharmacol. 2006;57:401-411. 7. Mita AC, Sweeney CJ, Baker SD, et al. Phase I and pharmacokinetic study of pemetrexed administered every 3 weeks to advanced cancer patients with normal and impaired renal function. J Clin Oncol. 2006;24:552-562. 8. Rinaldi DA, Kuhn JG, Barrios HA, et al. A phase I evaluation of multitargeted antifolate (MTA, LY231514), administered every 21 days, utilizing the modified continual reassessment method for dose escalation. Cancer Chemother Pharmacol. 1999;44:372-380. 9. Ciuleanu T, Brodowicz T, Zielinski C, et al. Maintenance pemetrexed plus best supportive care versus placebo plus best supportive care for non-small-cell lung cancer: a randomised, double-blind, phase 3 study. Lancet. 2009;374:1432-1440. 10. Kim YS, Sun JM, Ahn JS, et al. The optimal duration of vitamin supplementation prior to the first dose of pemetrexed in patients with non-small-cell lung cancer. Lung Cancer. 2013;81:231-235. 11. Rollins KD, Lindley C. Pemetrexed: a multitargeted antifolate. Clin Ther. 2005;27:1343-1382. 12. Adjei AA. Pharmacology and mechanism of action of pemetrexed. Clin Lung Cancer. 2004;5(suppl 2):S51-S55. 13. Gridelli C, Brodowicz T, Langer CJ, et al. Pemetrexed therapy in elderly patients with good performance status: analysis of two phase III trials of patients with nonsquamous non–small-cell lung cancer. Clin Lung Cancer. 2012;13:340-346. 14. Scagliotti GV, Parikh P, von Pawel J, et al. Phase III study comparing cisplatin plus gemcitabine with cisplatin plus pemetrexed in chemotherapy-naive patients with advanced-stage non-small-cell lung cancer. J Clin Oncol. 2008;26:3543-3551. 15. D’Angelo SP, Kris MG, Pietanza MC, et al. A case series of dose-limiting peripheral edema observed in patients treated with pemetrexed. J Thorac Oncol. 2011;6:624-626. 16. Kono M, Sakata Y, Sugawara T, et al. Assessment of risk factors for adverse events due to pemetrexed in patients with reduced renal function. Gan To Kagaku Ryoho. 2014;41:2587-2590.